During the winter months we tend to need higher amounts of Vitamin C. When you’re ill or exposed to stress (either physical or emotional), as much as 20–40 times more Vitamin C is needed for ultimate health and wellness. Unfortunately, our bodies cannot make this essential vitamin, so it’s really important to get it through your daily diet. Mix all the ingredients (apart from the juice and zest) in a blender. Once a smooth mixture has been formed, add the juice and grated zest. If the mixture is a little dry, either add some more juice, or add some warm water. If it’s too wet, add some more LSA or chia seeds. Once the consistency is right, roll into balls and place in the fridge to set. 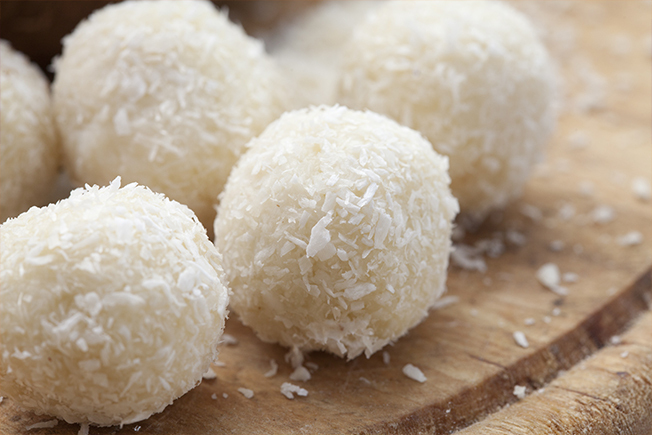 You can also roll the bliss balls in coconut to make them look extra special. Vitamin C has a wide range of benefits. We all know how important Vitamin C is for the immune system. It strengthens our body’s natural defence against many infections, but particularly colds and flu. It also contains antioxidants, which help fight off free radicals in the body, and it reduces histamine, which is released during allergic reactions. Did you know that Vitamin C is also needed by the body to make collagen, the substance which gives structure to muscles, bones, tendons and ligaments? Vitamin C is also important for healthy teeth, gums and your vision. Combined with zinc, it is excellent for healing wounds. What are the signs of Vitamin C deficiency? Deficiency symptoms include fatigue, muscle weakness, joint and muscle aches and bleeding gums. Prolonged deficiency can cause scurvy, a very rare but potentially severe illness. Three hundred years ago, scurvy was a real problem for sailors travelling on long voyages. Eventually a British doctor found that a daily ration of lime juice could prevent the horrible softening and bleeding of organs, tendons, skin, and gums that often led to the death of these sailors. While we are not at risk of scurvy so much any more, many of us struggle from a range of vitamin and mineral deficiencies, during winter especially. Sometimes a balanced diet is not always enough, particularly if you suffer from health demands that require higher doses – in these cases a Vitamin C supplement can be a beneficial health booster. The benefits of Vitamin C can extend to even more nutrients as it aids the absorption of iron and chromium. How much Vitamin C do we actually need? Although an RDI (Recommended Daily Intake) is the recommended daily intake to avoid major illness to support optimal health higher dosages are often required. The RDI of Vitamin C for healthy adults is 45mg. To support the immune system when suffering from a cold, Vitamin C can be increased to a total of 3,000mg daily, taken in 1,000mg doses three times a day. For more information on Recommended Daily Intake of Vitamin C, click here.